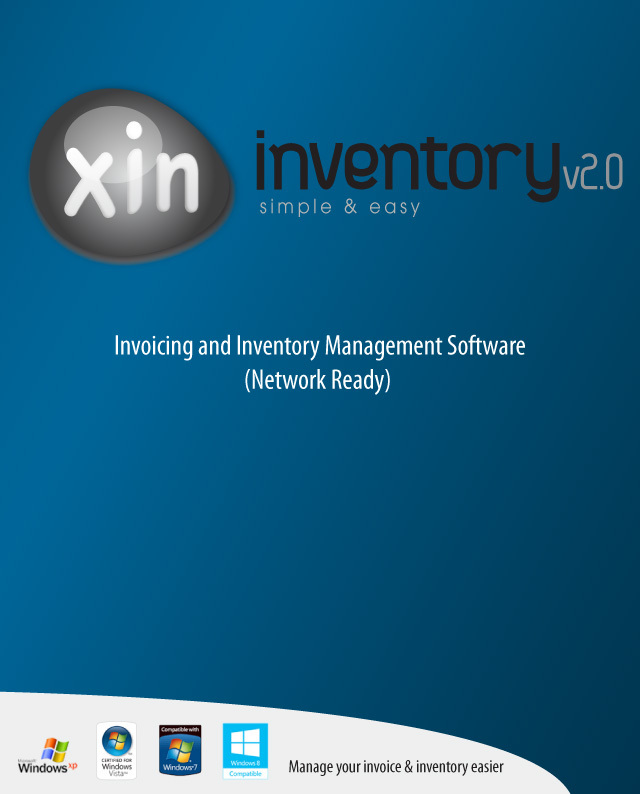 Xin Inventory 2.0 - Create Quotation, invoice, Purchase Order (PO), credit note, delivery note in minutes! Xin Inventory is a very handy and user friendly software to cater all level of user from novice to experience computer literate user. Network Enabled - Able to access by multiple computer in the same network. Stock Control / Inventory Control - Xin Inventory 2.0 software come with a complete inventory module with Re-order quantity alert, multiple price level, store receiving which will helps user in stock control. Customize Template - User able to customer own template like purchase order template (PO template), quotation template, invoice template, credit note template , delivery note template/packing slip template, customer statement template etc easily using Xin Inventory template editor. Customer Payment Tracking - User able to track customer payment in invoice module or report. This will make sure timely payment from customer. Support Paypal Payment in Invoice - User can include paypal payment in the invoice. 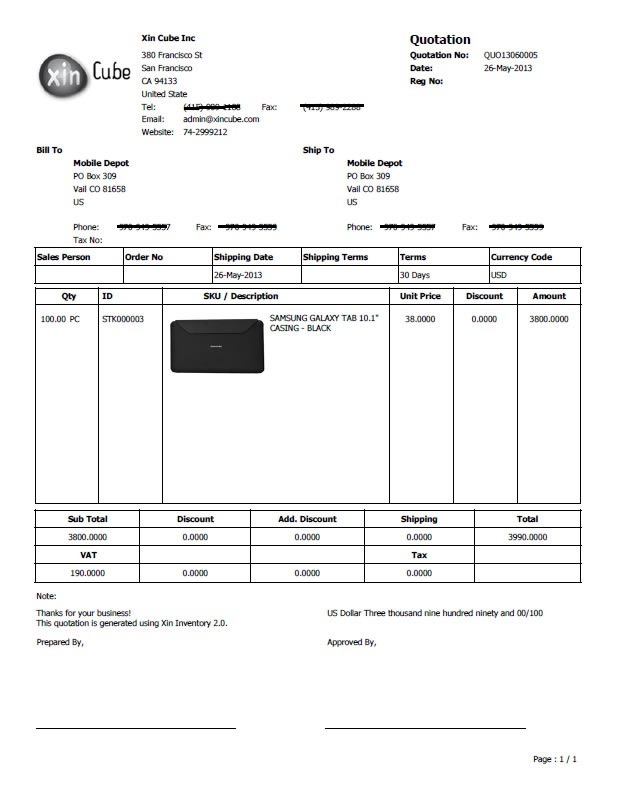 Customer can easily click on the link on the softcopy invoice and pay online using paypal. There are many more features come with Xin Inventory 2.0 software. Please download and test on it. I tested various quoting and invoicing solutions and was not impressed with any of them until I found yours. I am beyond impressed with your software.it's AWESOME! I highly recommend people download the trial and give it a shot. Seems to work okay after I finally got a template created. Actually, it's a pretty decent program for the money! This is a great software. You can't beat the price. I have purchased your invoice program and have been using it for some time now, we find it easy to use and the switching between company invoices is quick and easy. I recommend this product to all my mates. Thank you so much for your help in getting the software installed on one of our computers we would recommend your software to our clients without a doubt we will be looking at upgrading our licenses in the near future to accommodate more staff, thanks for the support cant fault it at all Thank you a very satisfied customer. It is quite useful and helpful for our company because we are operating Xin Inventory 2.0 network version. There are very powerful template for us to create own design. Especially Thanks to Xin on-line support. Your software and support service are first class in the industry! I am please to be a user of this simple yet professional XIN inventory software. I am now able to send quotes, invoices and purchase order with just a few click on the mouse/keyboard. The team at XIN setup my software for me online in only a few minutes. Thumbs up guys, i have been looking for a software like this for years and at such reasonable cost! Good job, great product. We are very happy with the software!